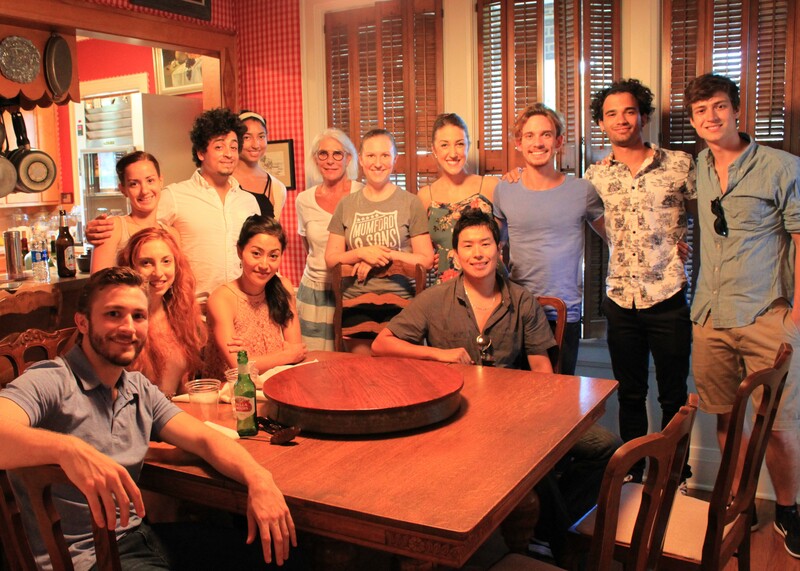 (L-R) Richard Walters (seated), OKC Ballet, Zoe Marnello-Kohn, San Fransisco Ballet (seated), Milena Garcia, OKC Ballet, Walter Gutierrez, Miki Kawamura, OKC Ballet (seated), Kayla Banks, Cathy Ross, Osage Ballet Choreographer Jenna Smith, Katherine Boatwright, Ballet Nebraska, Toleu Mukanov (seated), Walter Martin and Randy Crespo. 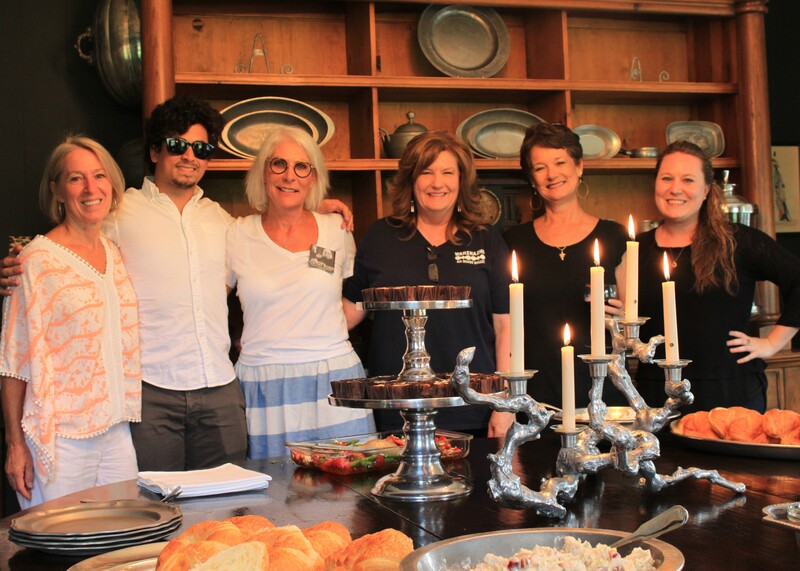 On Aug. 2, the evening before departing for Santa Fe for their Aug. 6 performances at the Lensic Performing Arts Center via tour bus, Osage Ballet Director, Randy Tinker Smith, and her lead ballet dancers gathered at Cathy Ross’s home for dinner and a chance to meet some members of the community. Debbie Reed, Pawhuska City Councilman Steve Holcombe, his wife Susie Holcombe, Osage Tribal Museum Curator Hallie Winter and Emily Haran were among those who attended. (L-R) Susie Holcombe, Osage Ballet dancer Walter Gutierrez, hostess Cathy Ross, Osage Ballet Director Randy Tinker Smith, Debbie Reed, Emily Haran, tap instructor at Dance Maker Performing Arts Academy. Ross, who owns a bed and breakfast in Pawhuska called The Mabelle, said, “I’m a promoter of the arts and tourism and I entertain a lot here.” Ross is also a member of Preserving Arts in the Osage. The evening provided an opportunity to hear from the dancers their emotional reactions to being a part of Wahzhazhe, an Osage Ballet, which tells the story of the Osage people through ballet. “Wahzhazhe” is the pronunciation of the word for the Osage people in their language. Banks, who lives in Denver Colo., is a performing artist trained in ballet, modern dance and stage work. She is dating ballet choreographer Jenna Smith’s cousin and on their first date he mentioned the Osage Ballet. Later, he sent her a YouTube clip of the ballet dancing. Banks described her reaction: “This is so cool! I’m Native American. I’m Comanche; my family lives down in Lawton, Okla., — that’s where our reservation and National Museum are. I had just learned about Maria Tallchief. You don’t hear about Native American ballerinas because ballet started in Europe. I’m also African American, so what Misty Copeland, an African American ballet dancer, is doing at ABT (American Ballet Theatre) is inspiring and what Maria Tallchief did. You realize that ballet’s not just for one skin color. It’s really universal – it’s everybody’s. “Then we went to the family reunion in New Mexico and that’s where I met Randy,” Banks said. After learning of her stage management background, Smith, who needed a stage manager, asked Banks to fill that important position. She accepted and even recruited a friend of hers, Andrew McIntyre, to be on the lighting crew. “He’s already in Santa Fe, waiting for us,” she said. Regarding her own dance career, Banks said, she is still in training, but she hopes to dance in the Osage Ballet one day herself. Referring to Osage Ballet Choreographer Jenna Smith’s Dance Maker Performing Arts Academy in Pawhuska, Banks said, the school’s goal is to raise dancers to perform the ballet. “I hope this will be a staple piece like the Nutcracker with other artistic pieces to follow,” Banks added. Lead dancer Miki Kawamura, originally from Sapporo in the northern region of Japan shared how she became involved in the Osage Ballet. She danced for the Osage Ballet in Santa Fe with permission from the Oklahoma City Ballet. Soon a DVD of the ballet arrived and Kawamura began learning the choreography, but at that point, she still did not fully grasp the emotional impact of her participation in the ballet. “Then I came here and I met them, and saw how proud they are about the tribe and the ballet. Before I came here I had no idea. The tribe and the city have a lot of feelings toward this ballet. I’m really honored to be here. “How many Japanese get to do this? I’m sure I’m the only one getting to do Native American ballet, so I’m glad I said yes. According to Director, Randy Smith, the Santa Fe performances on Aug. 6 at the Lensic PAC went well and were well attended. To learn of upcoming performances of the Osage Ballet, visit their website at http://www.osageballet,com and visit their Facebook page. The Osage Ballet operates under Art Maker. Donations may be sent to P. O. Box 1141, Skiatook, OK 74070.